In the late 19th century, Pilsen was inhabited by Czech immigrants who named the district after Plzeň, the fourth largest city in what is now the Czech Republic. The population also included smaller numbers of other ethnic groups from the Austro-Hungarian Empire, such as Slovaks, Slovenes, Croats and Austrians, as well as immigrants of Polish and Lithuanian heritage. Like many early 20th century American urban neighborhoods, however, Pilsen was home to both wealthy professionals and the working class, with the whole area knitted together based on the ethnicities, mostly of Slavic descent, who were not readily welcome in other areas of the city. Although there was some increase in the Hispanic presence in the late 1950s, it was not until the early 1960s that there was a great spurt in the numbers of Latinos in Pilsen. This was due to the displacement of Latinos from neighborhood UIC currently occupies. In 1970, Latinos became the majority population in Pilsen, surpassing the population of people of Eastern European descent. Many of the newer residents of the neighborhood are not Latino, and it is projected that the neighborhood will continue to become more diversified in the years ahead. The Chicago Housing Authority’s plan for transformation of the ABLA projects has spilled over into Pilsen proper, with the now nearly complete Chantico Loft development, Union Row Townhomes, as well as the defunct Centro 18 on 18th Street in East Pilsen. Infill construction of condominiums and single family homes is now in full force on the east side of the neighborhood, as Pilsen becomes one of the next major development areas for infill construction. Some local advocacy groups, including one led by Michael A. Martone, have formed urging the neighborhood’s alderman to curtail gentrification to preserve the Mexican-American culture. In 2006, Pilsen Historic District became a National Historic Register District. South Water Market has been added to the National Register of Historic Places. 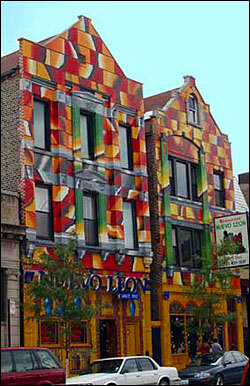 The east side of the neighborhood along Halsted Street is one of Chicago’s largest art districts, and the neighborhood is also home to the National Museum of Mexican Art. St Adalbert’s dominates over the skyline with the opulence typical of churches in the Polish Cathedral style. W 18th Street is an active commercial corridor, with Mexican bakeries, restaurants, and groceries, though the principal district for Mexican shopping is W 26th Street in Little Village, Chicago’s other formerly majority Pan-Slavic community. The United States Postal Service operates the Pilsen Post Office on 1859 S Ashland Avenue. Robb Walsh of the Houston Press wrote that the Mexican restaurants in Pilsen are “unconsciously authentic” to original Mexican cuisine. According to Rick Bayless, the chef and owner of Frontera Grill, this is because Mexican-Americans in Chicago do not encounter a substantial Chicano community that tells them how to cook food in the United States, so the immigrants use the same frame of reference that they had in Mexico. Metra’s BNSF Railway Line stops on the east at Halsted and 16th Street, and on the west at Western and 18th Street. There are also bikeways on Blue Island Avenue, 18th, and Halsted Streets.